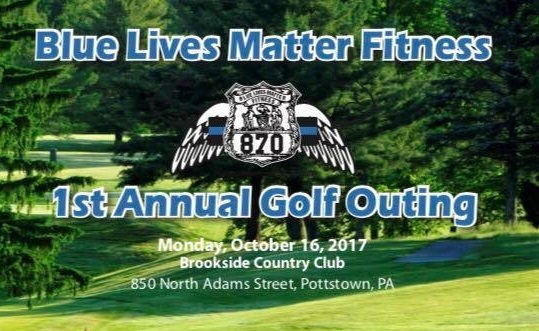 Please join Limerick Auto Body as we welcome Blue Lives Matter to Pennsylvania at the first annual Blue Lives Matter Fitness Golf Outing on October 16, 2017, at Brookside Country Club in Pottstown PA.
Blue Lives Matter Fitness was founded by three New York police officers with a passion for serving the law enforcement community, and brought to Pennsylvania by Corrections Officer Malissa Delibertis. Blue Lives Matter Fitness is a non-profit charitable organization that seeks to raise public awareness of the needs faced by injured or fallen police officers and their families. Funds raised provide gym memberships, personal training sessions, physical therapy and rehabilitation to local police officers injured in the line of duty, and assistance to the families of officers killed in the line of duty. The organization provides an outlet for these heroes and their families to pursue healing and a healthy lifestyle through fitness. Limerick Auto Body is proud to support Blue Lives Matter Fitness, and our heroes in blue who serve and protect our community in countless ways. The event will feature a 4-person scramble, multiple hole prizes, and an auction following dinner. Click here to purchase tickets. Not a golfer? Tickets are available to attend the dinner only, which will feature a surprise guest speaker you won’t want to miss! Sponsors, donations, and raffle prizes are still needed. Please contact Malissa Delibertis to donate or participate. She can be reached at 484-942-7641 or bluelivesfitness@gmail.com.